As Easter approaches, we always try to talk to our boys about the signs of new life in nature. In the past, I’ve tied this theme into our holiday celebration by including a packet of seeds in their Easter baskets, but this year I decided to go farther by transforming their “baskets” into personal mini gardens to be planted for spring. I used wooden wine boxes to make little raised beds and filled them with veggies, flowers, and kid-sized gardening essentials. And what’s a garden without a sneaky bunny? 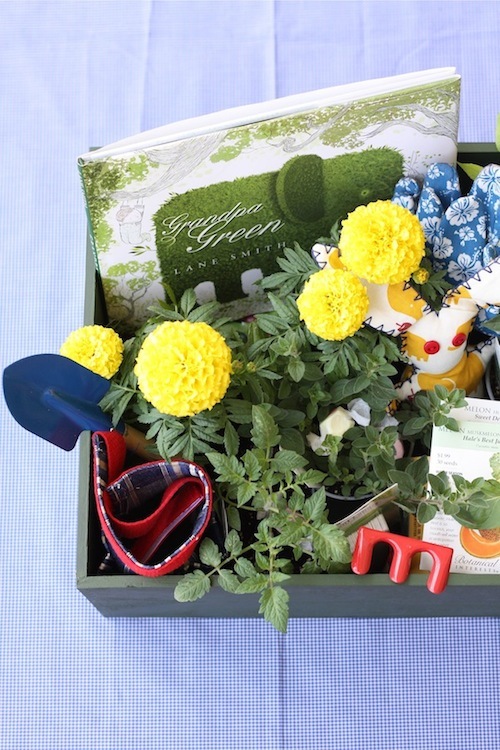 Not only are these boxes easy (and inexpensive) to put together, but they provide a project for the little ones that will last all spring and summer. Happy Easter! – Wooden wine boxes. I purchased mine for a few dollars from a local liquor store. – Weatherproof wood stain. 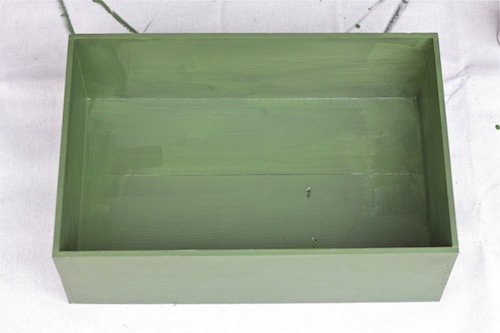 I used Behr solid stains in slate and ponderosa green to get a dark, opaque green. A sample sized can (about $2) was more than enough. – A variety of spring plants. I went to our local garden store and purchased two combinations that (according to the gardeners’ advice) would grow well together and be fun for the kids. One of our boxes holds two marigold plants, one chocolate mint, and a Roma tomato. 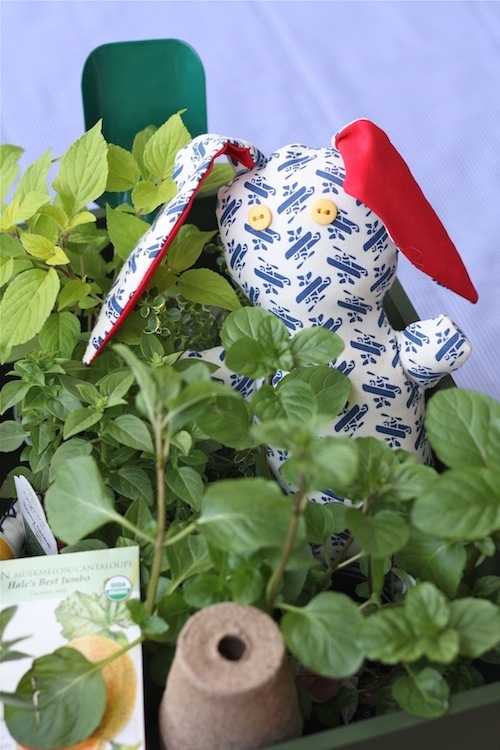 The other holds a flowering strawberry plant and a variety of herbs. Pay attention to the full-grown size of your plants — if there are too many, they’ll crowd each other out as they grow. 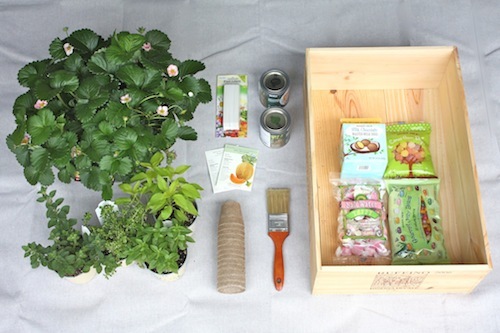 – Gardening “essentials.” Of course, this is up to you. I added a kid-sized trowel, shovel, and spade , a pair of gloves , a homemade gardening “tool belt,” garden markers, a package of seeds, and a few paper pots for starting the seeds. I also included garden-themed children’s books (Grandpa Green , by Lane Smith, for my older son, and And Then It’s Spring , by Julie Fogliano, for my youngest). -Treats to hide among the foliage (I used candy and handmade bunnies). 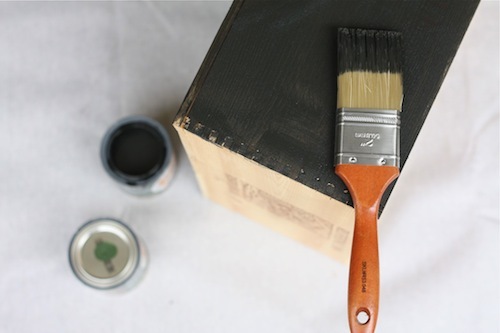 Use paintbrush and wood stain to paint the sides and entire inside of your wooden box. 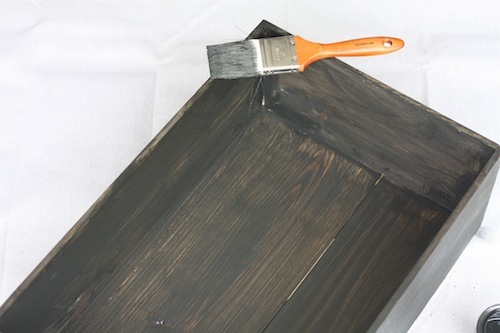 Stain dries quite quickly, so by the time you’ve finished the inside, the outside will be ready for a second coat. 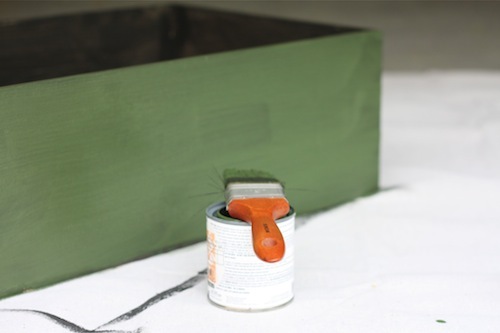 Cover box with a second coat of paint. If using two colors, as I did, use your top color for this coat. Let dry. Stuff your box! Start with the plants and then nestle the other goodies among them, so that they appear to peek out from the leaves. Hide little treats inside the plant pots and leave the basket in the sunlight for your little ones to find on Easter morning. And once the surprise is over, it’s time to prepare the gardens! Place your sprouts in a mixture of potting soil and mushroom compost, being careful to position them according to the specifications for each plant. Leave the boxes in the sun, water regularly, and wait for the magic to begin! P.S. — Instructions on how to make the adorable stuffed bunny right here. LOVE LOVE LOVE this idea! I’m always looking for was to un-junkify Easter Baskets and this is one of the most perfect solutions! I’m all for a little treat here and there but an entire basket of candy for my 5 year old? no thanks! She will LOVE this! the stuffed-bunny link ends up at a 404 page though :( would love to see the tutorial if it still exists! So glad you told me about the bad link, Kelli. Just fixed it! Looking forward to seeing your Stonehenge photos. We visited there with our family about ten years ago and loved it. I have a ways to go but will remember this thoughtful idea. I’ll never forget a Valentine’s Day box that my mother mailed which was along this idea. Thanks for sharing. oh this is so sweet! what a fun idea! We are totally doing this. Thanks so much for the inspiration! I absolutely love this idea! Brilliant! Awesome idea!! Now…I must hunt down children to give these to. :-) Thanks!! I am so in love with this garden set! Super cute! These are wonderful. Just wonderful! 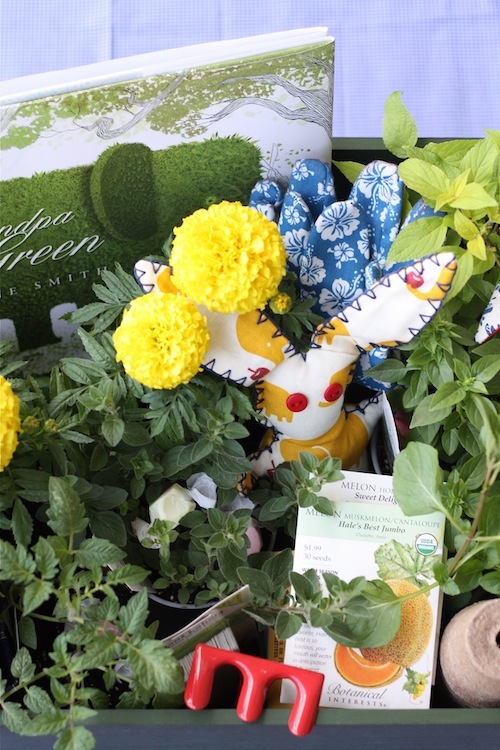 We are replanting our gutter garden next week….if I can find the time to get these together before Easter they would be perfect! This is a fabulous idea! I think I might get my little toddler involved and make one for Grandma! Thanks for the great idea! What a great gift for a spring birthday!! Totally, totally love this idea – totally!!! This is such a great idea! For some reason we’ve been having an incredibly warm spring here in the Upper Midwest, so we can think about plants instead of snowmen! Ours might be a slightly scaled-down version, but I think it would still be adorable. Thank you! Cutest Easter Basket EVER! Love it. This is so Fresh! This is just lovely to look at and imagine. It’s really tripped some imagining… thank you for sharing! 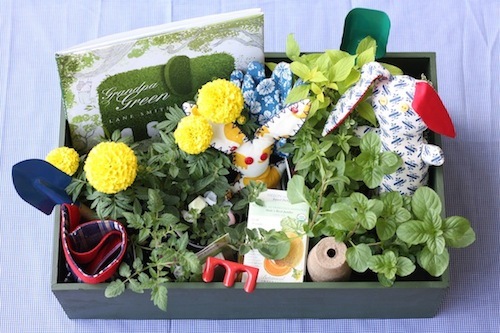 This is a very creative way to get kids into gardening. It would also make a nice kid centered hostess gift for a longer visit. I can’t wait to make one! Beautiful idea! I actually did something similar for my daughter last year. I decided that her basket though would be a pot she could plant the flowers in! And we are going to reuse the same one this year. Brilliant! I don’t need to think about doing anything else. Check, done! Thx. Here I am, Wednesday, dragging my feet, not wanting to give in to chocolate and flimsy baskets, and you have shared the most perfect idea! My girls love flowers/plants, so this idea fits perfectly. Thank you!! What a fantastic idea! I can’t wait to make these when my son is a little older. This cold be a fun spin-off for a birthday party too…the wheels are turning in my head now! Last year, we filled our baskets with seeds, child sized gardening tools and gloves. They had a blast planting all the seeds and working in the garden with me and we harvested veggies well into September. I love how these baskets takes it a step further and gives the children their very own gardening box (without the weeds!) and has a few plants already started! This is a lovely idea! I adore the tiny bunny and will be making three of my own! I’d love to have you link this to Seasonal Sundays. The link goes up at 7:00 on Saturday evening. I love this idea! It’s a great gift idea, as well — for a child or an adult! Ah! I love this! We don’t do baskets or junky candy, and I like to incorporate seedlings that my sprouts (see what I did there, lol) can baby all summer long. I do wish that bunny tutorial was still available, though. Thank you for the inspiration! This is so incredibly cute!! I love this idea!! I absolutely love this idea. What a great way to teach kids that Easter isn’t all about chocolate and jelly beans.